In addition to performance tuning my agency’s website in Craft CMS, I’ve explored the performance tuning options available in WordPress for this blog, one of my discoveries has been WP Super Cache. 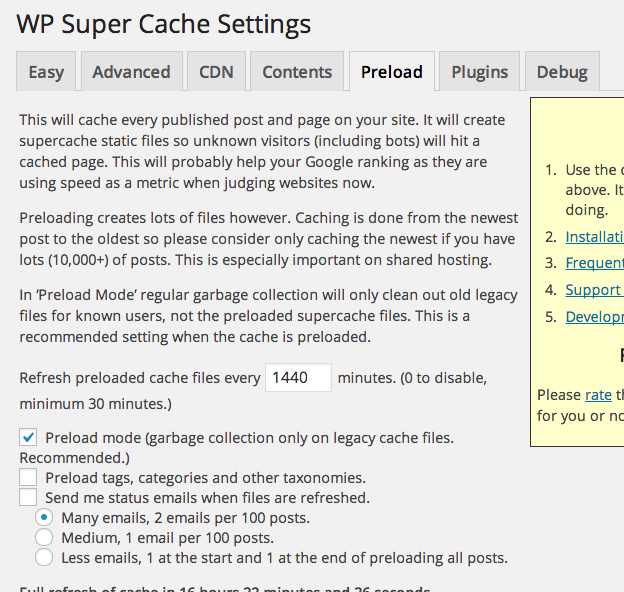 WP Super Cache is an excellent free plugin for drastically speeding up the performance of your WordPress site. Using WP Super Cache I was able to reduce to the First Byte time of PatPohler.com from 2 seconds to nearly 400 ms. That’s a 80% drop in page load! When you first use WP Super Cache, the various options it gives you can be a little overwhelming. To help get you started, I’m going to give you the the settings I use to power the cache on this blog. Please make a backup of your WordPress site (and DB) as well as your .htaccess file before doing any of these changes. Also do these changes when traffic is low on your site and there isn’t anything mission critical happening. If you have the mod_rewrite cache option enabled, follow the directions in “Mod Rewrite Rules” to add the required rewrite rules to .htaccess. You can edit the file manually or click “Update Mod_Rewrite Rules” to have WP Super Cache make the modifications for you. Note: The .htaccess rules will only work for Apache web servers. Here’s a great post on using Nginx & WP Super Cache that can give you similar results. Preload allows WP Super Cache to go through every one of your pages on an interval and generate static HTML to serve to your visitors. For a small site or blog this is perfect as it means your content will be served extremely quickly. You must set the interval to at least 30 minutes, however I recommend a higher number (especially for larger sites). I have our interval set to generate the content every 24 hours, or 1440 minutes. Once you’ve set the interval you can hit “Preload now” and WP will begin to pre-cache your posts, starting with the newest. In my mind this is the most important tab as generating your pages statically will drastically improve your site’s performance. With these minimal settings you should be on your way to serving a faster WordPress site! If you have any questions or any recommendations for WordPress please leave a comment.